You might have seen from my posts over the past few months, I've been loving Scandinavian culture, style, design-the works! I came across the term 'hygge' (pronounced hue-ger) on a few different European blogs I read and decided to learn a bit more. Hygge is a Danish word that cannot necessarily be translated into English but essentially describes anything that gives you all the cozy feels. For example, soft lighting, candles, quality time with friends, reading a good book by the fire, playing outside with your dog-basically everything good in life. Anyway, I got a little carried away and ordered four books on the topic-three of which I've read-working towards the forth. 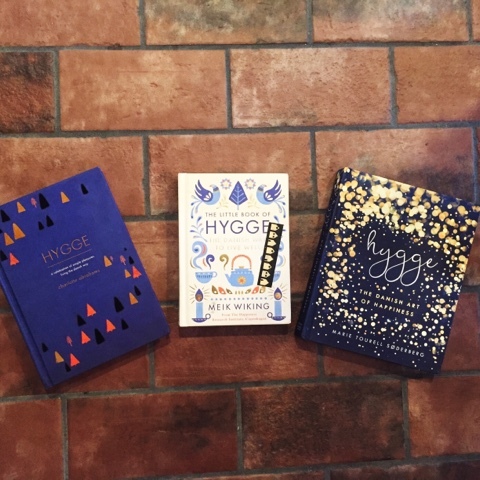 I read them in the order as they're shown above and figured I'd give a hygge overhaul review. This book was a great intro to Hygge and I think a good place to start if you're going to dive deep like I did. It's actually written by an English woman who explores hygge as a means of changing her life. She has been divorced and uses hygge as a means of embracing the good things in her life. She doesn't dwell on the divorce which would be pretty un-hygge, but instead mentions it, keeping it light. Light conversation, nothing too heavy, is very hygge. She doesn't dive too deeply into anything but does a great job explaining all of the concepts behind what makes elements of life hygge. One of my favorite portions of the book was that which described the importance of lighting. Scandis are obsessed with lighting and candles as am I. They prefer a glow which typically comes in the form of paper shaded lamps. This book left me wanting to embrace hygge more in my every day life and to reassess lighting in my house. Great little read. This book was kind of a bummer. Maybe it was because I'd read other books on the same topic that were excellent (cough better cough) but this one seemed like a regurgitation of all of the content in the other two. This one didn't have any new content that I can think of but it did have some pretty solid pictures, if you're into that. What are your thoughts on hygge? Have you learned about it or embraced it in your life? I'd love to hear your thoughts! Hey there-it’s Rachel. Native Atlantan. Raised in South Florida. Books. Travel. Horror. Hygge. Frenchies. Spicy food. Outdoors & adventures > everything. Why I Want to Drop Marie Kondo Off in a War Zone. © 2015 Life Devoured. Justine Template designed by Georgia Lou Studios All rights reserved.